We are going places, are we not, or should I say that I am actually the one taking you all over the world for home cooking food trail? I think I am. Pretty much we have been food travelling together, obviously in the virtual world, we can be at home and still head to all the different food destinations in any part of the world? Shall we now recall where we have gone so far? Of course everything must begin in our home ground Malaysia (Chinese Mixed Vegetable Stew, Onion Soup, Lentil Vegetable Soup & Burdock Root Soup) and particularly for soups, we did head to other countries as well. More or less (Vietnamese Fish Soup, Chinese Chicken Herbal Soup & Tom Yum Goong), then again, with cooking invention and cooking thinking, anything is possibly? I mean, the marrying of cooking technics and ingredients from different parts of the world (Salted Fish Bone Soup) and in Malaysia by itself, there's not only the three main races? In fact, there is no short of, you name it, the various types of food from the rest of the ethnic community? Furthermore, when we speak about vegetarianism, vegetarianism in our country and elsewhere too (Vegetarian Pumpkin Soup, Portuguese Caldo Verde Soup, Thai Tomato Soup, Japanese Vegetable Soup & Chinese Tofu Soup). What about this Moo Gook, aka Korean Radish Soup? 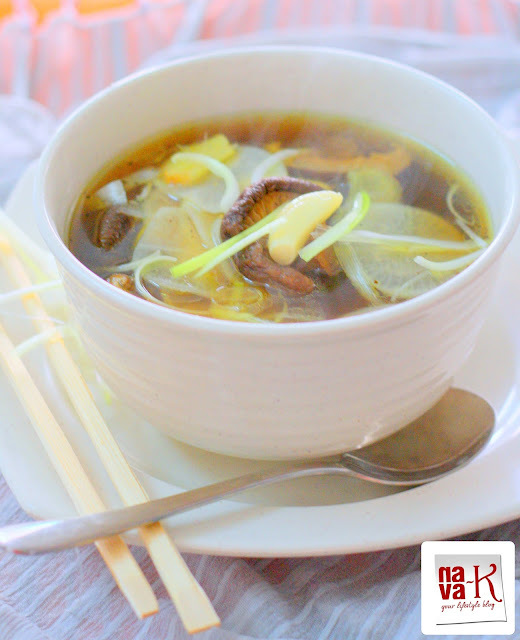 A vegetarian soup, or if you really feel you like to convert it to a non-vegetarian soup, I think beef is the meat you should add. Otherwise, just stick to my version of vegetarian Moo Gook. Moo Gook, aka Korean Radish Soup? Super smooth utter satisfaction by our home affairs common ingredients, except for buying Korean radish and Korean soy sauce. Saute ginger and garlic in heated oil. Simmer till both becomes soft and tender. Add the rest of the ingredients except spring onion. Remove from heat and garnish with spring onion. I love the flavor of radish and that soup sounds superb ! Lovely soup.. Healthy one indeed! Thats a healthy bowl Nava :-) Looks so comforting. I love both the two soup dishes you have put up! I am such a soup person hee. Esp love homecooked ones where by one is assured that there's no MSG/salt added unnecessarily! ha...ha... Nava, i also cooking a radish soup today, but just in the simple way, with ginger and salt. 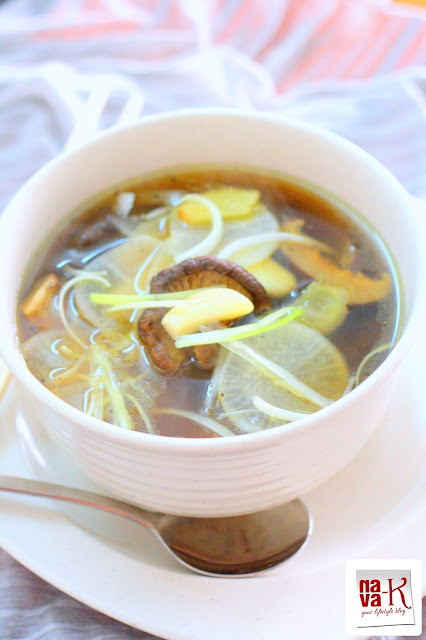 I love you for your soup recipies, i am a sucker for soups..
You are so innovative in soup recipes.. Mushroom and Radish is a new combo.. You are tempting me to try Soup recipes..
That's an amazing soup ! looks so comforting ! Love bowl of soup, I love mushrooms. Never had radishes though or if I did, I can't remember. Ok,this soup is totally new to me and I am already loving reading the ingredients and looking at the pictures, which by the way are really yummy. I haven't gone into Japanese cuisine as yet but would love to try this out. Looks most refreshing! All the ingredients won't be available though. I'll check out your Japanese Lotus soup now. A super healthy soup bowl.............i haven't tasted Japanese radish but will try with Indian radish. My my, love the way you pair your food. This soup looks amazingly healthy and comforting. wow ...soup looks really yummy n healthy..